The HOPE Ranch Property is For Sale! It’s true! The current Hope Ranch property is for sale, not the practice, just the property. This beautiful little oasis has served us well, but now it’s time to move to a new oasis, not far from here, to accommodate our evolving practice. More to come on that later. NOTE: We are still here. (It takes quite a bit of effort to ready the new ranch and move the animals.) We just wanted you to know that this incredible 4 bedroom, 3 bath, 3,864 sqft house on 7.86 acres is ready for its lucky new owners. A place with incredible spirit and positive vibes that has helped so many over the years. This premium location is just minutes from downtown Rochester. Tell your friends! 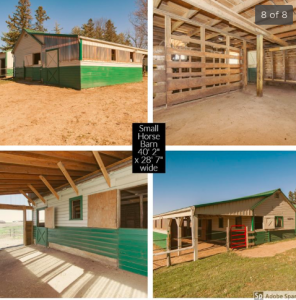 See the full listing and photos here: Hope Ranch Property Listing. 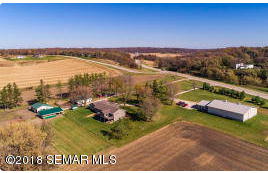 Well appointed charming ranch style home situated on 7.86 acres designed with efficient pasture management making this a perfect hobby/horse farm. The attention to detail both inside and out along with a prime location makes this home a must see. Every detail of this property is designed with style and comfort. Dramatic vaulted ceiling over open living room, dining room, kitchen with center island and breakfast bar. Custom-built Ash cabinets by Jones Cabinets. Large walk in pantry. Cork floors in kitchen and dining room. French doors open off kitchen/dining area onto the 4-season sun porch with panoramic view of pastures and rolling SW hills. Filled with natural light it is a wonderful place to grow and winter over your plants. Patio doors open onto large deck with stairs to back yard and patio. Warm colored tile flooring with radiant heat. Master bedroom en suite with tray ceiling and patio doors from bedroom to private deck. Master bath has tile floor with radiant heat, shower, large soaking tub, his and hers sinks, large linen cabinet, Red Birch custom cabinets by Jones Cabinets. Large walk through closet with pocket door between closet and bath. Space saving custom clothing organization system. Surround sound throughout majority of rooms excepting guest bedroom and bath. 2 additional bedrooms, 1 with walk in closet, are nestled in the back of the house for greater privacy with easy access to mudroom, guest bath, and garage. Oversized mudroom with built in cabinets, coat closet, laundry, utility sink, dog shower, and pocket door access to guest bath. Front entrance with coat closet; from large front porch. Forced air heat, radiant heat, and Central air. Energy saving blinds, curtains and roller shades (shades new July 2018). Attached extra deep 2.5 car insulated garage connected to LP tank for future heater. 29’ wide x 28’ 4” deep. Large Family/Entertainment Room high ceilings, patio doors and large windows with pasture views. Full walk-out through patio doors onto custom built paved patio. Den/Study with egress window/4th bedroom w/armoire with beautiful view of pastures and hills. Full bath with generous linen closet. All freshly painted August 2018. Potential Mother-in-law apartment. Wired. Insulated. Ready for future appliances. Egress window. Ready for future 6th bedroom in home. Radiant in-floor heat with multiple zones. Learn more or view the photo gallery here. Bullying In The Workplace: A National Epidemic? Bullying isn’t just about schoolkids or athletes. It’s rampant in many workplaces, no matter the industry. It is said that workplace bullying has become a national epidemic. In fact, the Workplace Bullying Institute, which has been around for 20 years, conducts studies on the topic and works to combat this debilitating problem. Whether you are an employee or the employer, these facts will serve as a wake-up call. Teasing; especially when it takes a personal nature; comments about the target’s work, behaviors, and even family members. The creation of impossible expectations and changing expectations or directions in the final moment. there are groups more often targeted than others. Recognize that it’s not your fault. Take an assessment of your mental and physical health. Being bullied at work can weigh heavily on you and your health. Consider taking time off to clear your head. Very importantly, don’t allow yourself to replay the acts of bullying over and over in your mind. Put a name to what’s happening to you so you can legitimize it; bullying, abuse, harassment, etc. Once you have done this it’s time to get down to business. Document the abuse. Not with emotion but with just the facts; time, date, perpetrator, description of abuse. Expose the bully. Bullying doesn’t get better on its own and if it continues, you are 77.7% likely to lose your job anyway, typically due to either health problems or simply choosing to leave on your own. You actually have little to lose by exposing the bully. Here’s how: A) Present the case from a business standpoint. It is expensive and legally risky to have a bully in place, which is something a business should care about. They do not care about your emotions or how this makes you feel. (sorry, they just don’t.) Give the employer only one chance and if they stick up for the bully, it’s time to plan your exit strategy. If an employee comes to you, listen, and even, shut up. Take in what the employee is saying, without offering an explanation or saying things like, “That’s just the way he is” and don’t ever say anything that puts the blame on the target. The employee obviously wants to stay in their job so remember that. They simply want the problem solved. Remember the “shut up” advice in point #1. That’s because this is a hairy area and you are not likely equipped to deal with this, which is okay. Most people are not. Take action to correct this: Seek help, pull in counselors or consultants that are knowledgeable in this area. Send the perpetrators to training/counseling. Use this as a learning experience. Now is the time to write policies and develop a process for ongoing education and awareness of workplace bullying. I’m passionate about improving the lives of people in the workplace locally. In fact, HOPE Ranch provides team building, corporate development, and staff retreats to organizations in the Greater Rochester Area, and Greater Minnesota, and Northern Iowa. Just as psychotherapy facilitates individual growth and healing, corporate retreats and development facilitate identification of issues in your team/organization, and development and implementation of real, effective solutions. We see real breakthroughs happen in a safe and helpful environment. If you’re having an issue with your team or suspect you have a bully in your midst (even if you might be the bully) reach out. We’ve helped many others and we can help you. facilities such as Olmsted County, Omnia Family Services, Gerard Treatment Facilities, Mendota Mental Health Institute and Mayo Clinic. Posted in UncategorizedLeave a Comment on Bullying In The Workplace: A National Epidemic? RAIN OR SHINE. The Rendezvous & Carnival is ON! Rain or Shine, the Saturday, October 7th Rendezvous & Carnival is on! This is no problem for us at the Ranch. 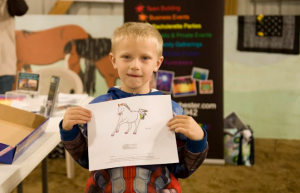 We have a great big arena that can hold the carnival games, silent auction, animals, crafts and more! Get the kids out of the house and into the Arena for a fun day at H.O.P.E. Ranch! Admission is free and there’s plenty of free parking. Hope to see you there! Posted in UncategorizedLeave a Comment on RAIN OR SHINE. The Rendezvous & Carnival is ON! Doors open to the public at noon on Saturday, with food and beverages from local restaurants, face-painting and henna booths, a driving simulator challenge, games, success stories, displays, raffles, a silent auction and more. Guests will have the opportunity to have photos taken with the cast and crew of “Learning to Drive” as well as Miss Minnesota USA International 2017, Rochester’s own Zoey Jantsan. Admission to the event is free. Tickets to the film screening are $10 for adults and $7 for students and seniors. Admission to the after-party with director and cast is $25. Tickets can be purchased online at http://abcinc.org/celebratingabilities. All proceeds go to enriching the lives of persons with disabilities in the community. A highlight of this year’s event is a special screening of “Learning to Drive,” beginning at 4:00 pm in the Century Auditorium. This heartwarming, upbeat film tells the story of two brothers, one with Down syndrome, who embark a road trip to take their mother’s ashes to the Grand Canyon. The film has been screened at numerous festivals and has won several awards. Director Roderick E. Stevens, II and lead actor Connor Long will be present to introduce the film and answer questions. Guests can spend more time with both at an exclusive after-party beginning at 6:30 pm. Celebrating Abilities is made possible through the generous support of gold-level sponsor Think Mutual Bank, silver-level sponsors Minnesota Autism Center, Minnesota 97.5 FM and the Sadler family, and nine bronze-level sponsors. The 2017 H.O.P.E. Ranch Rendezvous and Carnival will take place Saturday, October 7th from 10 am – 3 pm. This is a fun-filled day for kids and adults and we are looking for volunteers to help with the activities. There are many ways to participate, either the day of or prepping for the event. We need people to run the carnival games, silent auction, crafts area, face painting & more. Grab a buddy if you’d like. We take pairs of volunteers. Click here to check out the possible jobs and/or to sign up! This event has grown by leaps and bounds. We promise a fun time! The event is held at H.O.P.E Ranch and admission and parking is free. The best part is, this is a fundraiser. All proceeds go for client scholarships and animal care. To volunteer: click this link. Or call us at 507-281-3033. May is Mental Health Awareness Month in the United States and has been observed in this country since 1949. Special attention is given and activities occur during the month. Awareness about mental illness is brought to the public reaching millions of people through the media, local events, and screenings. The purpose of Mental Health Awareness Month is to educate the public about mental illnesses such as depression, schizophrenia, and bipolar disorder. This includes symptoms and possible treatments for these illnesses. Conversations about the realities of living with mental illness take place and strategies are shared for dealing with it. Additionally, discussions about and exercises for attaining and maintaining mental health and wellness become a part of the month’s activities. Bringing attention to suicide is also a part of Mental Health Awareness Month as mental illness can contribute to suicide attempts in both adults and youths. Knowledge is power. The more educated the public is about mental health issues, the better the outcomes. A huge goal of mental health awareness is to reduce the stigma that surrounds mental illnesses. 1 in 5 adults in America experience mental illness. 1 in 25 adults live with a serious mental illness. 50% of chronic mental illness begins by the age of 14. Depression is the #1 cause of disability around the world. Serious mental illness costs $193 billion in lost earnings each year. 90% of those who die from suicide have an underlying mental illness. The following infographic, courtesy of NAMI, shows the numbers, impact, and consequences of mental illness. The good news is that there are effective treatments for those suffering from mental illness. If you think you or someone you know needs help, the first step is to pick up the phone and call a mental health professional. They’ll walk you through the rest. The Rendezvous & Carnival Hits RECORD NUMBERS! First Things First: Thank You! Thank you all for attending and/or supporting our 2016 H.O.P.E. Ranch Rendezvous and Carnival: A fun day of celebration at H.O.P.E. Ranch that raises money for client scholarships and programs and helps provide care for the animals. We are happy to report that this year’s numbers are higher than ever! With this year’s proceeds we are able to fund more scholarships and programs than ever before. The money from the silent auction, baked goods sales, games and donations surpassed last year’s numbers. This helps clients, for instance without insurance, pay for services and allows us to partner with others, such as MN Teen Challenge Rochester, to provide programs to address specific needs. We also give a huge shout out to our volunteers this year. Great volunteers are critical and we want to thank the individuals who stepped up. A special thanks to the Mayo High School swim team for coming out although it was their homecoming! We truly appreciate each and every one of you and hope to see you back next year. If you’d like to volunteer throughout the year we can always use help with animal chores. 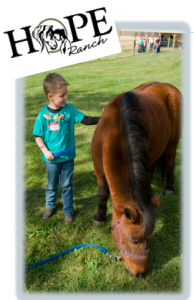 Contact Andrea at: officeadmin@hoperanchteam.com or fill out the volunteer form on our website. I’d be remiss if I didn’t mention our staff who volunteered countless hours. Amanda Briggs & Andrea Benike. Thank you! We couldn’t do this-literally-without the financial and in-kind support from our sponsors. Be sure to support them back by frequenting their business. Yes. There will be another Rendezvous. Mark your calendars (it’s typically the first Saturday in October.) If you have feedback, we’d love to hear from you. Send an email with the subject line: Rendezvous feedback to officeadmin@hoperanchteam.com. Kit Muellner is the Owner & Founder of H.O.P.E. Ranch. She is a Licensed Independent Clinical Social Worker and is an EAGALA Certified Psychotherapist and Horse Specialist. Kit is well known as a stand out in her field, specializing in work with children, adults and families. Before starting H.O.P.E. Ranch in 1999, Kit worked with facilities such as Olmsted County, Omnia Family Services, Gerard Treatment Facilities, Mendota Mental Health Institute and Mayo Clinic. Posted in UncategorizedTagged H.O.P.E. Ranch Fundraiser, Rendezvous & CarnivalLeave a Comment on The Rendezvous & Carnival Hits RECORD NUMBERS!